Vel Tech TBI (Technology Business Incubator) enables technology embedded and innovation powered start-ups to survive and scale across a wide-spectrum of thrust areas with funding, infrastructure, mentorship, industry networking, resources and training. 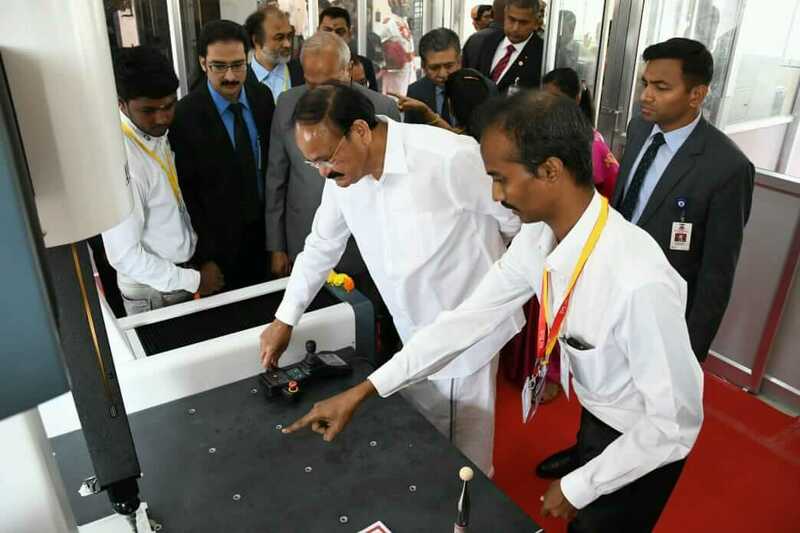 The thrust areas include Digital services & Products (covering all technology based ventures including AI / ML / DL, Fintech, AR/VR, IOT, Gaming, Cloud, Big Data, Analytics, Cyber security, Mobility etc), 3D Printing and Additive Manufacturing, E-waste & Plastic waste management, Core Manufacturing, Healthcare and Bio-Incubation, Automobile Technology, Renewable Energy, Agriculture etc. Veltech TBI provides space, funding, mentoring, networking, training etc to startup Incubatee’s. Conducting training programs relating to various components of entrepreneurship including technology, innovation, GST, Finance, E-commerce, Digital transformation, Bio-incubation, Product management etc wherein one can participate as a trainer or attend as a trainee delegate. Financial Support INR 50.00 lakhs, the start–ups would be supported primarily on the following from the seed support Product development, Testing and Trials, Test Marketing, Mentoring, Professional Consultancy, IPR issues, Manpower for day to day operations . If you have long experience of industry experience, domain/technology expertise, entrepreneurship experience, one can be enrolled as a mentor to Vel Tech TBI incubates. Equipment Support subsidized rates includes Digital services & Products (Centre of Excellence on AI / ML / DL), 3D Printing and Additive Manufacturing, E-waste & Plastic waste management, Core Manufacturing, bio technology, Automobile Technology, Renewable Energy, Agriculture Unmanned Aerial Technology etc. Since Vel Tech TBI contains various interesting ideas and business models, one can be an investor on some of these ideas. Be connected with Vel Tech TBI and evangelize the various elements of TBI to the social media contacts in Facebook, Twitter, Linked in etc.. Since the incubates are potentially the seeds of future large enterprises, partners like Google, Amazon and others are providing various offers to help the startups to survive and scale. In future these startups will be major evangelists of those who helped them with great. Incubatee’s are rendering various products and services to the world and one can be a potential user of some of the products and services originating from Vel Tech TBI startups. Vel Tech TBI has state- of- the- art facilities to train and facilitate young graduates to become entrepreneurs in the field of E-Waste Management and other related areas like 3D Printing, Embedded Systems/VLSI, MAV/ Robotics, Automobile, Renewable Energy and IT/ITES.E-Waste Management: A Training Centre, established for processing E-waste. The Centre is equipped with the following facilities capable of treating the waste under the three stage treatment processes. Suitable Workbenches and Hand Tools are provided to the trained work men for carrying out manual operations involving dismantling of E-Hardware, segregating and storing of various components so as to keep them ready for the second stage operations. Many Computers are dismantled and various components are segregated for feeding to the second stage operations. Discarded articles made out of non-bio degradable Plastics materials such as Polyethylene, polypropylene, polystyrene, polyurethane, polyester, polyethylene, nylon, Kevlar, Teflon etc. pose enormous environmental problems. As such, these are to be treated appropriately and find alternate uses for the treated materials. In order to treat such materials, the TBI has installed Facilities like Plastics Crusher and Plastics Baler for processing the Wastes and dispose them for alternate uses. Machines consisting of Shredders and different types of Separators equipped with Conveyors for material handling, Control panels etc. are under installation. Using these machines, the E-Wastes will be separated in to Ferrous, Non Ferrous and non metals. With a full- fledged Analytical Laboratory consisting of essential Lab Equipment / Instruments and sophisticated Equipment like Atomic Absorption Spectrophotometer created under VelTech TBI, the focus on the important stage of separation of metals can be carried out by research mode. The Incubatees with business interests on E-Waste Management will be oriented on the three important R’s in preserving the Environment, namely “Reduce, Reuse and Recycle” principles and trained in E-waste treatment processes so that they can make business venture in this important area. Dealing with Bio-Wastes (both solid and liquid types) and arriving at safe methods of treatment and disposal require extensive analysis of the samples to be carried out in the laboratory to study the effects of the contents and prescribe Solution for disposal or converting into useful byproducts. Typically, the solid wastes generated by agricultural and domestic areas are taken up for treatment by composting methods for deriving useful products like bio manure etc. The Liquid wastes, primarily the Effluents generated by Leather Tanning Industry and Textile Industry are analyzed and treated from the point of view of separating heavy metals like chromium and harmful chemicals like various dyes and the treated water can be used for gardening and other useful purposes. 8. “REMI” High speed Centrifuge etc. More than thirty such facilities with required Chemicals, Glassware etc. are available in the Laboratory. The Incubatees can avail the facilities at very nominal Testing charges to get the required analysis done for their Business ventures. An Incubator cell has been created to facilitate the Incubatees in having a separate office and transacting their business. The Pre-Incubation space/cell (150 to 200 Sq.ft ) will be provided free of cost for first 18 Months and from Nineteenth month onwards would be charged at the rate of Rs. 7/- per Square feet. The cell will be provided with furnished and equipped with individual terminals and Internet facilities so that each Incubatee can utilize the facilities for the Business networking purposes.. Any specific requirement to meet the demands of the incubatee may be created at additional cost by Incubator; the cost may be borne by the incubatee. Qualified Personnel from the Institution with appropriate background and having relevant R&D experience are managing the respective groups and guiding the Incubatees for career orientation. External Experts in the respective areas as well pool in their contribution in organizing Workshops, Seminars etc. Radhakrishnan Narayanaswamy and Mallappa Kumara Swamy (2018). Chapter Elucidation of Mechanisms of Anticancer Plant Compounds Against the Tumor Cells. In: Mohd Sayeed Akhtar and Mallappa Kumara Swamy (Eds.) Volume 4. Anticancer Plants: Mechanisms and Molecular Interactions (in press), Springer Nature Singapore (Springer Publisher). —– (Book chapter). Ramesha Alurappa, Srinivas Chowdappa, Radhakrishnan Narayanaswamy, Uma Rani Sinniah, Sudipta Kumar Mohanty, and Mallappa Kumara Swamy (2018). Chapter 21 Endophytic Fungi and Bioactive Metabolites Production: An Update. In: Jayanta Kumar Patra, Gitishree Das, Han-Seung Shin (Eds.) Volume 2. Application in Food and Pharmacology, page no: 455-482, Springer Nature Singapore (Springer Publisher). —– (Book chapter). Vijayakumar Veeraragavan, Radhakrishnan Narayanaswamy* and Rameshkumar Chidambaram (2017). Predicting the biodegradability nature of imidazole & its derivatives by modulating two histidine degradation enzymes (urocanase and formiminoglutamase) activities. Asian Journal of Pharmaceutical and Clinical Research, 10, pp.383-386. Radhakrishnan Narayanaswamy, Lam Kok Wai and Norhaizan Mohd Esa* (2017). Molecular docking analysis of Phytic Acid and 4‑hydroxyisoleucine as Cyclooxygenase‑2, Microsomal Prostaglandin E Synthase‑2, Tyrosinase, Human Neutrophil Elastase, Matrix Metalloproteinase‑2 and ‑9, Xanthine Oxidase, Squalene Synthase, Nitric Oxide Synthase, Human Aldose Reductase, and Lipoxygenase Inhibitors. Pharmacognosy Magazine, 13, pp.S512-S518. Radhakrishnan Narayanaswamy, Lam Kok Wai, F. Abas and I. S. Ismail (2017). Molecular docking analysis of Curcumin analogues as Matrix metalloproteinases (MMP 2 and MMP 9) inhibitors. Journal of Applied Cosmetology, 35, pp.55-62. Vijayakumar Veeraragavan, Radhakrishnan Narayanaswamy and Rameshkumar Chidambaram (2017). Molecular docking analysis of Imidazole derivatives and Polybenzimidazole analogs as inhibitors of Superoxide dismutase (SOD) and Xanthine oxidase (XO). IEEE International Conference on Smart Technologies and Management for Computing, Communication, Controls, Energy and Materials (ICSTM) proceedings, 2-4 August 2017, pp.513-516. Radhakrishnan Narayanaswamy, Lam Kok Wai, Intan Safinar Ismail, 2017. Molecular docking studies of Quinones against Human inducible nitric oxide synthase (iNOS). Journal of Chemical and Pharmaceutical Research, 9(5), pp.39-44. Radhakrishnan Narayanaswamy* (2017). Molecular docking analysis of Alginate oligosaccharides (Alg2-Alg6) as bacterial collagenase inhibitor. Journal of Applied Cosmetology, 35(July-December issue), pp.15-23. Prakash, N.U., Bhuvaneswari, S., Kumar, M.R., Lankesh, S. and Rupesh, K., 2014. A Study on the prevalence of indoor mycoflora in air conditioned buses. British Microbiology Research Journal, 4(3), pp.282-292. Arokiyaraj, S., Arasu, M.V., Vincent, S., Prakash, N.U., Choi, S.H., Oh, Y.K., Choi, K.C. and Kim, K.H., 2014. Rapid green synthesis of silver nanoparticles from Chrysanthemum indicum L and its antibacterial and cytotoxic effects: an in vitro study. International Journal of Nanomedicine, 9, pp.379-388. Santhanakrishnan, D., Perumal, R.K. and Chandrasekaran, B., 2014. Effect of tannery soaking water on antioxidant enzymes of Salicornia brachiata. International Journal of Current Microbiology and Applied Sciences 3(2), pp.359-367. Udayaprakash, N.K., Ranjithkumar, M., Sripriya, N., Pujitha Lakshmi, R., Deepa, S. and Bhuvaneswari, S., 2014. Antioxidant, free radical scavenging activity and GC-MS studies on Pedilanthus tithymaloides (L.) Poit. International. Journal of Pharmacy and Pharmaceutical Sciences, 6(11), pp.284-287. Bhuvaneswari, S., Sripriya, N., Deepa, S. and Udayaprakash, N.K., 2014. Studies on antioxidant activities of six cultivars of Piper betle Linn. International. Journal of Pharmacy and Pharmaceutical Sciences, 6(11), pp.270-273. Bhuvaneswari, S., Deepa, S., Sripriya, N., Prameela, L. and Prakash, N.U., 2014. Antioxidant activity and phytochemistry of various flowers from Tamil Nadu, India. International Journal of Research in Pharmaceutical Sciences, 5(1), pp.40-45. Santhanakrishnan, D., Perumal, R.K., Kanth, S.V., Rao, J.R. and Chandrasekaran, B., 2013. Antioxidant and cytotoxic effects of methanolic extract of Salicornia brachiata L. in HepG2 cells. International Journal of Research in Pharmaceutical Sciences, 4(4), pp.512-517. Arokiyaraj, S., Saravanan, M., Prakash, N.U., Arasu, M.V., Vijayakumar, B. and Vincent, S., 2013. Enhanced antibacterial activity of iron oxide magnetic nanoparticles treated with Argemone mexicana L. leaf extract: an in vitro study. Materials Research Bulletin, 48(9), pp.3323-3327. Prakash, N.U., Bhuvaneswari, S., Balamurugan, A., Radhika, B., Bhagya, R., Sripriya, N., Prameela, L., Sarojini, S., Vigneshwari, R., Chandran, M. and Arokiyaraj, S., 2013. Studies on phytochemistry of 100 plants in Chennai, India. British Journal of Pharmaceutical Research, 3(3), pp.407-419. Prakash, N.U., Bhuvaneswari, S., Divyasri, D., Kurien, N.A., Uma, P. and Arokiyaraj, S., 2013. Studies on the phytochemistry and bioactivity of leaves of few common trees in Chennai, Tamil Nadu, India. International Journal of Pharmacy and Pharmaceutical Sciences, 5(3), pp.88-91. Prakash, N.U., Bhuvaneswari, S., Preethy, S., Rajalakshmi, N., Saranya, M., Ruth, J. and Arokiyaraj, A.S., 2013. Studies on antibacterial, antioxidant, larvicidal, pesticidal activities and phytochemistry of leaves of Alangium salvifolium (L.f) Wang. International Journal of Pharmacy and Pharmaceutical Sciences, 5(2), pp.86-89. Bhuvaneswari, S., Balamurugan, A. and Prakash, N.U., 2013. An Assessment of fungal quality of Solum fullonum–A cosmetic base. Indian Journal of Applied Microbiology, 16(1), pp.55-61. Bhuvaneswari, S., Azeez, N.A., Aditya, S., Manohar, B.S., Gurusamy, R. and Prakash, N.U., 2013. Mycometric investigation of carpets in commercial centres of Chennai, India. Indian Journal of Applied Microbiology, 16(1), pp.34-40. Tamilarasan, K., Nanthini, R., Prakash, N., Renganathan, N.G. and Prakash, N.U., 2013. Evaluation of antimicrobial property of few co-polyesters. International Journal of Research in Pharmaceutical Sciences, 4(4), pp.604-607. Udaya, P.N.K., Bhuvaneswari, S., Balamurugan, A., Vaishnavi, S., Sugunan, S., Meena, S., Chandran, M. and Babu, H.S., 2013. Studies on antibacterial, antioxidant, larvicidal, pesticidal activities and phytochemistry of Leonotis nepetifolia (Linn), International Journal of Research in Pharmaceutical Sciences, 4(2), pp.303-309. Prakash, N.U., Bhuvaneswari, S., Balamurugan, A., Ashwin Karthik, N., Deepa, S., Hima Aishwarya, Manasveni, K.S., Sahana, S., 2013. Studies on bio activity and phytochemistry of leaves of common trees. International Journal of Research in Pharmaceutical Sciences,4(3), pp.476-481. Prakash, N.U., Bhuvaneswari, S., Jahnavi, B., Abhinaya, K., Rajalin, A.G., Kumar, M.P., Sundraraman, G., Elumalai, K., Devipriya, S., Kannan, V. and Sriraman, V., 2012. A study on antibacterial activity of common weeds in northern districts of Tamil Nadu, India. Research Journal of medicinal plant, 6(4), pp.341-345. Vijayaraghavan, K., Nalini, S.K., Prakash, N.U. and Madhankumar, D., 2012. Biomimetic synthesis of silver nanoparticles by aqueous extract of Syzygium aromaticum. Materials Letters, 75, pp.33-35. Vijayaraghavan, K., Nalini, S.K., Prakash, N.U. and Madhankumar, D., 2012. One step green synthesis of silver nano/microparticles using extracts of Trachyspermum ammi and Papaver somniferum. Colloids and Surfaces B: Biointerfaces, 94, pp.114-117. Prakash, N.U., Selvi, C.R., Sasikala, V., Dhanalakshmi, S. and Prakash, S.B.U., 2012. Phytochemistry and Bio-efficacy of a weed, Dodonaea viscosa. International Journal of Pharmacy and Pharmaceutical Sciences, 4(2), pp.509-512. Prakash, N.U., Sowmya, S., Priyadharshini, C., Hamsalatha, P., Tirupurasundari, M., Arokiyaraj, S. and Bhuvaneswari, S., 2012. Studies on bio efficacy of weeds in Tanjore district, Tamilnadu, India. International Journal of Pharmacy and Pharmaceutical Sciences, 4(5), pp.132-134. Arokiyaraj, S., Perinbam Kb, Vivek Pa, and Udaya Prakash, N.K., 2012. Free radical scavenging and in vitro cytotoxicity activity of agnuside from Vitex agnus castus (Verbenacae). Journal of Pharmacy Research, 5(6), pp. 2548-2552.
in Vel Tech TBI – (Technology Business Incubator).